By constructing haplotypes using adjacent SNPs the authors arrive at a superior set of genetic variables with which to compute genetic similarity. These haplotypes tag rare variants and seem to recover a significant chunk of heritability not accounted for by common SNPs. While genome-wide significant associations generally explain only a small proportion of the narrow-sense heritability of complex disease (h2), recent work has shown that more heritability is explained by all genotyped SNPs (hg2). However, much of the heritability is still missing (hg2 < h2). For example, for schizophrenia, h2 is estimated at 0.7-0.8 but hg2 is estimated at ~0.3. Efforts at increasing coverage through accurately imputed variants have yielded only small increases in the heritability explained, and poorly imputed variants can lead to assay artifacts for case-control traits. We propose to estimate the heritability explained by a set of haplotype variants (haploSNPs) constructed directly from the study sample (hhap2). Our method constructs a set of haplotypes from phased genotypes by extending shared haplotypes subject to the 4-gamete test. 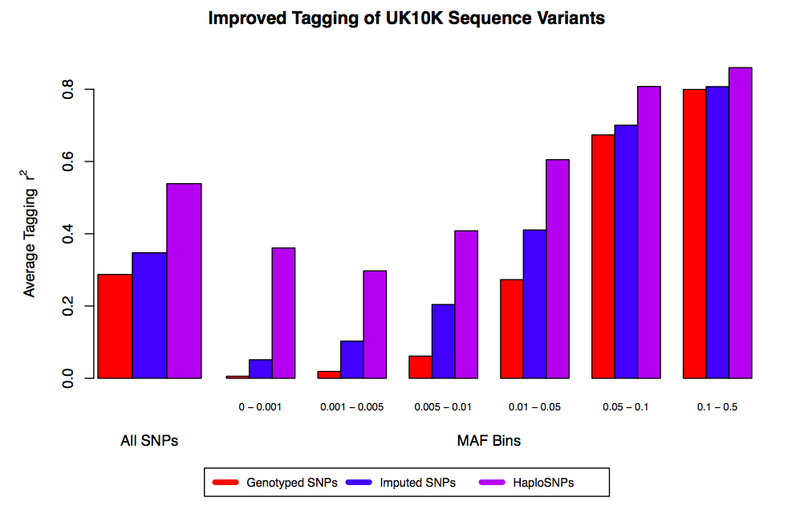 In a large schizophrenia data set (PGC2-SCZ), haploSNPs with MAF > 0.1% explained substantially more phenotypic variance (hhap2 = 0.64 (S.E. 0.084)) than genotyped SNPs alone (hg2 = 0.32 (S.E. 0.029)). These estimates were based on cross-cohort comparisons, ensuring that cohort-specific assay artifacts did not contribute to our estimates. In a large multiple sclerosis data set (WTCCC2-MS), we observed an even larger difference between hhap2 and hg2, though data from other cohorts will be required to validate this result. Overall, our results suggest that haplotypes of common SNPs can explain a large fraction of missing heritability of complex disease, shedding light on genetic architecture and informing disease mapping strategies. Your summary is correct, AFAIU. Below is a bit more detail about the 4 gamete test, which differentiates between a recombination event (which breaks the haploblock for descendants of that individual; recombination = scrambling due to sexual reproduction) and a simple mutation at that locus. The goal is to impute identical blocks of DNA that are tagged by SNPs on standard chips.